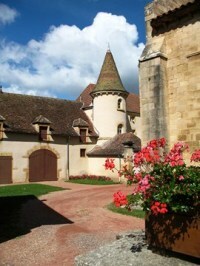 See further customer comments regarding this and other self guided holidays in Burgundy. 7 nights in two high quality small guest houses in historic properties. Both are in chateaux and one has a swimming pool. They have been chosen for their local charm and character, high standards and warm welcome. Full board accommodation, evening meals are traditional and delicious local dishes. Picnic lunches prepared by your hosts. Transfers to and from Lyon if needed, 7 night's full board accommodation. Full walking notes and maps, transport of luggage between two guest houses. Travel to Lyon, France. Lunches on arrival and departure days. Any excursions and entrance fees. Travel insurance. This unique centre-based walking holiday takes place in the Brionnais, an off-the-beaten-track region of southern Burgundy in France. In the shadow of the high Beaujolais hills, the green and picturesque hills of the Brionnais lead you towards the mighty Loire Valley. These rolling hills and valleys are made up of a patchwork of grazing fields and copses where you'll pass from beautiful secluded valleys with babbling streams to open ridges with great panoramic views. This secluded and quiet part of south west Burgundy is perhaps best known for its architectural treasures, which rival some of the more popular parts of Burgundy, a region known world-wide for its hospitality, and great food and wine. A number of delightful villages, immaculately maintained and decorated with lovely floral displays, are home to fine Clunian churches and abbeys, as well as a number of other historic buildings. Clayette has an amazing chateau, whilst Semur-en-Brionnais, classed as one of the prettiest villages in France, sits on top of a ridge with its 10th century chateau St Hughes, the oldest one in Burgundy, overlooking the Burgundy hills. Inside its village walls you'll also discover a wonderful church and a number of historic houses, whilst on the outside, the valley slopes are planted with vines. Your centre-based walking holiday is based in two locations allowing you to see the best of the Brionnais at your own pace. Pick up from Lyon or direct to your accommodation near Clayette. A warm welcome in a medieval chateau in a lovely village in Eastern Brionnais where you'll get to sample some of the fine Charolais meat with your evening meal. Breakfast and leave direct from La Clayette or transfer to Lyon. 7 nights in two good quality small guest houses in historic properties with ensuite rooms. They are both in chateaux and have been lovingly restored. One of the guest houses has a swimming pool. They have been chosen for their local charm, high standards and warm welcome. Full board accommodation, evening meals are a chance to enjoy some traditional and delicious local dishes, as well as getting to know your hosts. Wine is included in the price at Chateau Grandvaux. Picnic lunches are prepared by your hosts and include a fine selection of fresh local produce. The guest houses are both in rural locations located on the edge of the nearest village. The two guest houses we usually use are presented below. If they are not available we will inform you before booking an alternative. Chateau de la Chaix B&B A wonderful manor house built in 1902 in the style of the large Parisian houses. It was also formerly a wine makers property. Rimma will give you a very warm welcome and take great pleasure in looking after you during your stay. Lovely rooms and beautifully restored common areas. Great food. Transfers between Lyon Airport and Lyon train stations and the south Burgundy region of France are included in the price of your independent walking holiday. The airlines Easy jet, Flybe and British Airways have scheduled flights from the UK - Luton, Birmingham, Gatwick, Edinburgh and Heathrow to Lyon St Exupery airport. Note: Please check concerning the availability of a holiday before booking any flights. If you need further information or would like to discuss any aspect of your travel arrangements, please contact us, we’re here to help you. We would be happy to book travel arrangements to Lyon, France on your behalf. Eurostar and the TGV provide a relaxing journey from London to Lyon Part Dieu direct and changing at Lille. Please use Rail Europe's train finder on our travel shop page to organise your train journey. 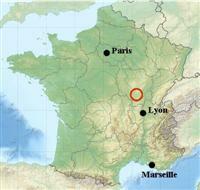 It is also possible to go via Paris and to get a TGV that stops at Macon Loche. If you wish to go direct to your guest house, you can catch a train from Lyon Part Dieu station heading towards Tours and get off at La Clayette-Baudemont station. There would then be a short transfer to your guest house. Once in France, the journey from Calais to the Burgundy area takes about 6 and a half hours (excluding long breaks).